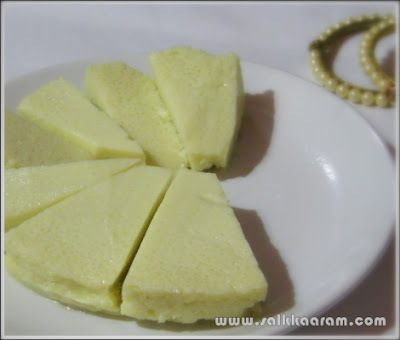 Vatlappam | Simple and Delicious ! 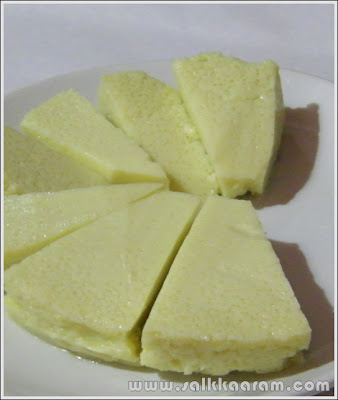 Am not familiar with this dish, Vatlappam, my reader Lifa sent me this recipe. She said her family prepared this for breakfast on Eid day and served along with idly, vada etc. The procedure is simple and the ingredients are only few and the outcome will not disappoint you! Lifa is a Dr / busy homemaker who found time to send me few short notes of some other interesting recipes too, am waiting to try out them Lifa.. Thank you! Add milk and mix well.. Grind cashews into fine paste,add to egg mix along with other ingredients. Apply ghee on a flat bottomed vessel, pour the mixture into this. Double boil in a cooker. For this use the small vessel you got with pressure cooker or any other steel or aluminium vessel, take enough water in cooker and place the vessel in that and boil. When the steam comes very well,simmer it for 20 to 25 minutes. Remove from fire when once it is cooked, allow to cool. Chill and serve by cutting in the desired shape. Alternate u can use microwave also.. Instead of milk u can use coconut milk. How are u? Hope that all doing good.Eid Mubarak!! I never heard this ..Easy to make,I will try this. can u explain double boiling in cooker in more detail and how to make this in micro oven..
assalamu alaikum dear,pour enough water in a cooker,put a stand in it.place a flatbottomed vessel ,diameter shud b less than that f cooker..place this vessel above d stand..close the cooker..wen steam comes well,keep in low flame 4 20 to 25 min..if still confusing kindly tell me which part s confusing..in mw,use flat vessel,fill nly upto threefourth..cook in high power 4 5min..then reduce power to medium 4 3min..if still nt cooked extend for 2min..resting time 5min..if iam nt clearkindly tell.. Thanks for explaining sis. Will try the recepie inshahAllah. i am from pakistan ,i like your recipes and am going to try them as soon i finish off with my house cleaning .i have seen lovely and beautiful pictures of kerala where you belong.so much beauty .god has been very kind.it must be peaceful also. i live in karachi ,weare passing through bad times with daily killings,no peace of mind,pl. pray in your namaz==salat for my country.